Sun rising. Moon River playing in the background. Breakfast in hand. Delicate string of pearls around the neck. Eyes gazing into the window of Tiffany’s on 5th Ave in New York City. If you have no idea what I’m talking about (I’m not sure we can be friends), this is the beginning scene of one of my absolute favorite movies, Breakfast at Tiffany’s. Also, totally joking about the whole friends thing, of course we can still be friends, silly, but we’re going to need to have a movie night stat. There’s so many things I love about this movie (if you ever want to discuss, let’s have breakfast at Tiffany’s sometime), but one of my favorites is Holly Golightly’s iconic pearls. They’re just so classy. They go with everything. And I have a feeling they will never go out of style. I don’t know about you, but this sounds a lot like the guy I went on a date with last week (read more about my date here)- Jesus. Matthew 13:46 says “When he [the merchant] finds a pearl of great price, he goes and sells all that he has and buys it.” After reading this verse, I’m like yes, definitely the merchant, I need to sell all that I have because Jesus is a pearl. But sometimes, most times, I’m not the merchant. My humanness takes over. I hold onto things of this world. I only sell a little of what I have. But what always holds truth is Jesus, the merchant. He finds YOU- a pearl of great price, He goes and sells all that He has, to the point of death, to purchase you. Every second of the day. All you have to do is look at the Cross. Yes, be the merchant. Sell away the attachments of this world, of sin, for your pearl, Jesus. But know that when you fall short (and unfortunately, we will), Jesus still values you as His classy, priceless pearl. These are my Holly Golightly pearls. I don’t wear them often, but when I do, I am reminded that I am Jesus’ pearl. When better to be reminded of this gift than a night with the KC symphony. I even got a compliment on my pearls that night! Here’s my symphony outfit, which consist of a white button up, black pants and pearls, all from jcrew factory, black Jessica Simpson pointed toe heels, and a black clutch. Get the look below. Gosh, I feel like I’ve rambled on about myself. Tell me more about you! 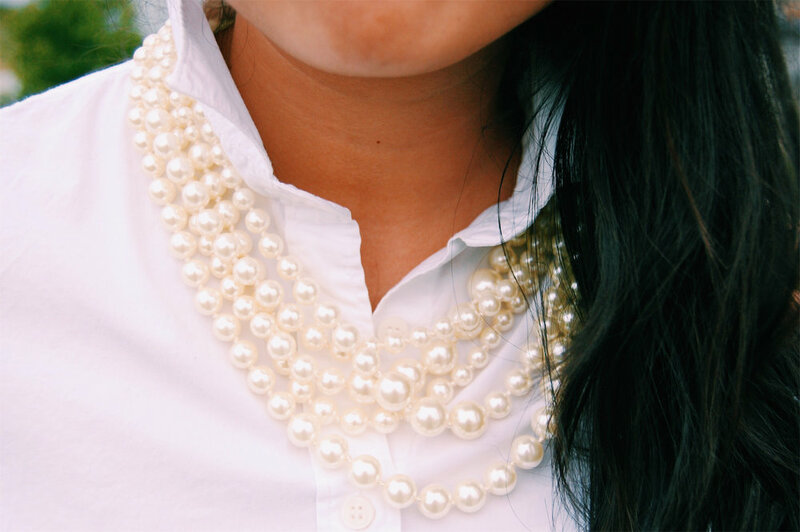 How do you wear your pearls? How does Jesus treat you like a “pearl of great price”? Comment below, I would love to hear from you! As always, thank you so much for reading! Know that I am offering Mass and praying for you. A special thank you to my Spiritual Director for always letting the Holy Spirit use him and giving him words to inspire this post; you’re the best!